The headline feature is Opera’s claim to be the first Web3-ready browser. Web3, also known as the Decentralized Web, makes use of blockchain to provide P2P transactions without the need for a trusted intermediary, whether that’s Facebook (social media), Uber (ride sharing) or Airbnb (short-term lets). Opera’s support for Web3 comes with its integrated Crypto Wallet feature, which is designed to allow users to store and use cryptocurrency, complete blockchain-secured transactions and use Web 3 applications direct from within the browser. The Crypto Wallet will sync between user’s desktop and Android versions of Opera. When a user is asked to identify themselves to a Web3 service, a notification is received on their smartphone, which can be confirmed using whatever security is on the phone, such as facial recognition or fingerprints. The feature will be rolling out to Opera Touch, Opera’s new iOS browser, soon. The browser itself has also received another facelift in the form of a borderless design -- dividing lines have been removed to avoid "unnecessary distractions". Light and Dark themes have also been added, inspired by high- and low-key photography lighting, with subtle touches added like making the currently selected tab more visible. Opera’s free browser VPN service has also received an under-the-hood service to improve its speed. Users have only a broad choice of location -- Americas, Europe or Asia -- compared to third-party services, but it’s still better than no VPN at all, particularly when connected to insecure networks. 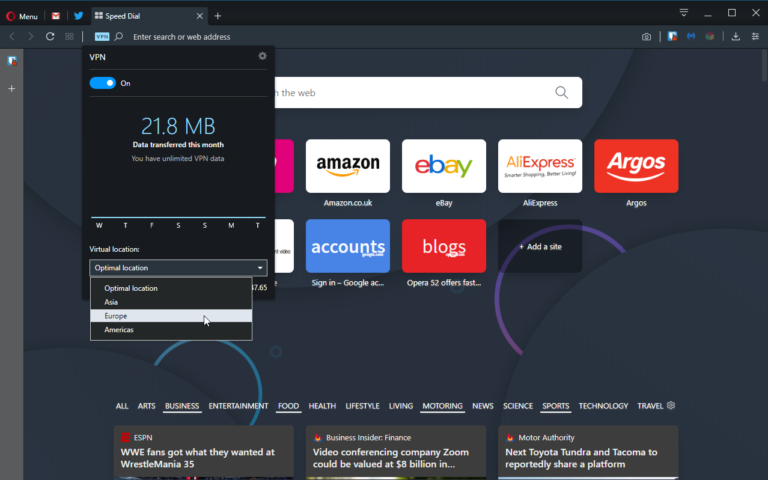 Opera 60.0 is available now as a freeware download for Windows, Mac and 64-bit Linux users. Existing users can update from within Opera itself -- simply open the Opera menu and choose About Opera to do so.